Poured from a 12 oz can. It's golden, with a bit of a head. The smell is pretty mild, barely noticeable. The taste is a bit grainy, a bit hoppy (not too much). Overall, this is an innocuous enough beer, pleasant but not in the least memorable. Named after the ancient writing associated with the beer, I give full props for helping remind us beer started in the middle east of all places. As far as taste goes , its smooth and strong enough for me. Pours a nice, faintly hazy, light golden color. Thick, frothy head. Light floral / piney aroma - no doubt PNW hops are used here. Well hopped and balanced, right on target for an American Pale Ale. Quite drinkable, good with food, very smooth and a nice lingering aftertaste. Recommended. Poured from a 12 oz. can. Has a rich golden color with a 1 inch head. Smell is of citrus, mango, some passion fruit. Taste is the same as the aroma, plus some pine, moderate bitterness. Feels medium bodied in the mouth and overall is an enjoyable beer. A pale yellow and light NW Pale Ale. Sweet and fruity, lean on hop bitterness. I'd have this again but some caramel flavors and more of a malt presence and hop bitterness would help. Looks good out of the bottle. Decent head. Almost seems like a gimmicky beer or I am reading to much into the name. 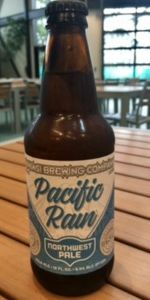 The smell and taste are "Pacific rain". A little musty meets foliage and watery. I can't tell of I like it or not. Looks very refreshing - golden yellow glow with a thin foamy and sudsy head that settles into large and small soapy bubbles. Smell is fairly strong for a NW pale ale, definitely reminiscent of citrus and pine. Taste follows the nose with crackery malta and a sort of dark sedimenty earthiness. Mouthfell is fine - medium carbonation, crisp, on the thinner side, unfortunately carbonation falls off pretty quick. Easy to drink but pretty unremarkable when the carbonation starts falling flat. Overall a quenching and enjoyable NW pale ale. Hazy golden amber with one finger of five minute white head. Good rings of lace. Smell is floral and biscuit. Taste is complex hop notes. Floral citrus mango resin and sweet biscuit malt. Mouthfeel is light to medium with decent carbonation. The finish is medium bitter and dry. Overall a tasty and easy drinking APA. I enjoyed it.